Nicoz Balboa is an Italian visual artist who uses her life events as inspiration for works ranging from painting, drawing and tattooing to pyrography, graphic journals and sketch works. She reveals her hopes, failures and successes in candid and, at times, critical works that are frequently both tragic and humorous. The themes of provocation and sexuality repeatedly surface as her works are firmly rooted in the tradition of feminist discourse. Nicoz was born in Rome, and studied at the IED (European Institute of Design). After graduating she spent time at the E.S.A.G. in Paris. In 2002, Nicoz created a 2 minute cartoon with the french avant-garde screen printers group, Le dernier Cri, for the film “Les religions sauvages”. She has also created posters for rock groups such as Unsane, Motorama, the Normals, the Intellectuals, Bloody Hollies, the Smackdown, and PH Fred. In 2005, Nicozpublished her first solo comic-album, Nicozrama, with the Italian publisher, Centro Fumetto Andrea Pazienza. In 2008ed, she published another solo comic book Les larmes the crocodile, with the french publisher, “DIANTRE!”. In 2017, Nicoz once again published her work, this time a selection of her graphic novels in a book called “Born to lose”, with the Italian publisher Coconino Fandango. 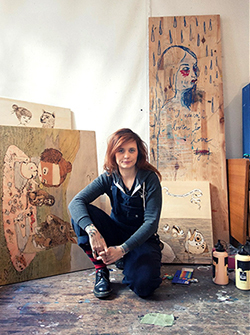 Nicoz has exhibited extensively, including solo and group exhibitions in New York, Los Angeles, London, Paris, Berlin, and Rome.In 2010, Nicoz was selected as a finalist in the Lissone Prize, which recognises the world’s leading young artists. Nicoz has travelled the world using her tattooing skills and has worked as a guest tattooist in some of the coolest tattoo parlors including Mystery Tattoo Club in Paris, Eight of Swords in New York, Salon Serpent in Amsterdam, the Ten Bells Tattoos in Rome, 1770 Tattoos (formerly in 2u) in Brighton, and Turbo Zero and Tattoo Family Parlor in La Rochelle where she’s a rest debt artist. Since 2017 she has been a designer for the brand Wooden Finger, which she founded with Lorena Rossi and Ariel Kinski. Nicoz lives and works in France and regularly undertakes guest work in both Italy and the UK.